I felt really bad having this book on my shelf for so long and not having read it. I would see it every time I entered my room and it would sit there in all of it's wordy defiance against me. I wondered, sometimes, if it was mocking me. Goading me with it's interesting and unique cover. I'd finish reading one book and there it sat on my shelf, unread and not yet loved by its owner. It deserved better than what I had offered it, so I decided that before I read any other deserving book on my shelf, I needed to read this one next because it deserved it way more than the others. Two days before the start of her junior year, seventeen-year-old Janelle Tenner is hit by a pickup truck and killed—as in blinding light, scenes of her life flashing before her, and then nothing. Except the next thing she knows, she’s opening her eyes to find Ben Michaels, a loner from her high school whom Janelle has never talked to, leaning over her. And even though it isn’t possible, Janelle knows—with every fiber of her being—that Ben has somehow brought her back to life. I didn't know what to really expect from this book. I don't think I ever even read the synopsis of it, even after I purchased it. The reason why I bought it was because many people were giving it very good reviews and the girl is brought back to life by this dark and mysterious Ben figure. Oh, and I really liked the cover model's outfit. Gotta love tank tops and a kickass jacket. Also, this is the first book, after many--umm, thirty-seven to be exact--that made me release those wicked and evil tears of mine. I've always been told I cry a lot during books and apparently there's really no reason for it, but after thirty-seven books, I'd say that's not that bad at all. I certainly can't be that much of a mush ball when it comes to books. Okay, okay, this is all beside the point I'm trying to make here. What I'm trying to say is that this book make me feel things. It was emotional and definitely a gripping story with many plot twists and turns. Janelle was a very strong character, not as strong as Tris from Divergent, but strong nonetheless. She was very smart and nerdy and was accompanied throughout the book by her best friend, Alex, who also happens to be a complete smarty pants. She's determined and never lost sight what she was aiming for in the long run: To save the world--duh. I didn't really mind her flaws most of the time. She was stubborn and didn't always make the right choice and sometimes I wanted to strangle her for what she would do, but everybody makes mistakes and you forgive. Her character was understandable, and she would do anything for her friends and family. I'm not going to say much about the story, because no matter how I phrase it, I know I'm going to slip and give away something you shouldn't read. All I will say is that it was awesome. It had plenty of believable emotions, action, and more. Usually the feds get in the way of what goes on and it only annoys everyone, but not in this book. Sorry for being a bit cryptic with all I'm saying, but I really want to save the experience for when you read the book. 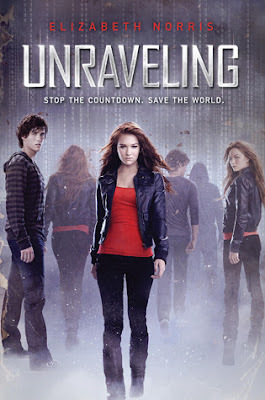 I gave Unraveling 4.5 out of 5 stars, and I know it rightfully deserves that rating. I can now say that this book has been read and loved by me and I hope that others will, too. Sidenote: I love the "Stop the countdown. Save the world." phrase under the title. Honestly, it makes me giggle each time I read it because every time I can imagine Janelle saying it all nonchalantly with the shrug of her shoulders. You know, save the world. No problem. I got it covered. Gotta love the small things, right? I've heard a lot of good things about this book, and own it, but still haven't read it. I'll have to check it out!